I finally finished quilting the beast that was panel three of my charity ArtPrize quilt project. I had some thread tension issues in the wee hours of the morning that cost me some valuable time and sleep, but I’m back on track and a little more in tune with my machine. If I’ve learned anything from this morning’s rip-out session it was to pay attention to the sound of my machine and any changes in tension I feel. After I dropped in a new bobbin last night, I noticed that the machine sounded different and the quilt started to glide a little too easily. But I was tired and very anxious to wrap out work on the panel three so I kept sewing…. for miles. And then when I finally flipped the quilt over to check my work, it was clear that I had made a serious error. Thread was bunching up and the stitches were too loose. I still can’t believe I kept sewing when I knew something was off. After wasting about 2.5 hours of my life ripping out stitches, I’m happy to report that all is well with panel three. I ripped out the stitching on the section I goofed and quilted it again. I’m paying very close attention to tension now because I think I will need to be institutionalized if this happens again. As luck would have it, I had a box of review samples from Simplicity sitting in my dining room when this quilting debacle unfolded. When I realized I was going to have to rip out about a bobbin’s worth of meandering stitches, I ran to the box to retrieve 4 1/2″ Curved Blade Snips by Simplicity. Little did I know that these little snips that retail for $17.99 would be my tool of choice when I needed to rip out stitches fast. I was beyond exasperated when I pulled these babies out and started carefully ripping out the mess I made. I pinched the blade shut and used the tiny points to get under small stitches and loosen them up before clipping. In the past I’ve used a seam ripper to remove machine quilting mistakes, but I find the snips faster and more effective. From here on out I’m going to keep a pair of snips on hand for situations like these. I put the snips to a serious test and they passed with flying colors. One of the pitfalls of scrambling to finish a project on deadline is not thinking things through. I was unthreading my machine and winding bobbins as I needed them because I was tired, it was very late and this seemed like a logical thing to do. I know. Sewing while sleepy leads to silly mistakes. Another product that I busted out is Simplicity’s new Deluxe SideWinder, a portable bobbin winder. I admit that I was a woman of little faith when I opened the box because I own a smaller version of this product by Wrights and never got it to work quite right. But I needed a way to wind a bunch of bobbins without disturbing the tension of my threaded machine. So I fired up the Deluxe SideWinder today. I didn’t set the tension disks correctly the first time in my haste to get on with my quilt project, but that was definitely a case of operator error. Once I tightened the disks correctly I was good to go. The bobbins wound fast and spared my sewing machine motor that seems to be performing at its limit. 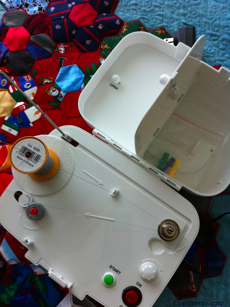 This winder contains two storage compartments to keep the power cord and assortment of spindles sized to hold bobbins from a variety of name brand machines. 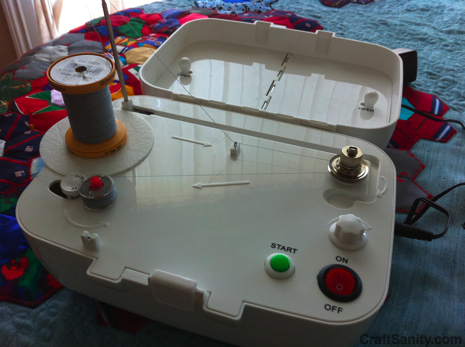 You can adjust this machine to wind threads of varying weights and control speed and how much thread you want to go on each bobbin. You can also use this machine to wind bobbins from 1200 yard cones. I have yet to try winding thread from a cone, but I like the results I got today. If you sew a lot and want to wind a bunch of bobbins without taxing your machine, this is a quality product to consider. It retails for $99, so it’s a bit of an investment. But after the events of the last 24 hours, I’m wishing I would have had the clarity of mind to open the box and try out this product sooner. Ok. I have to get back to work. I’ll be weaving in the ends tonight and then moving on to panel four. Just two more to go. What is your favorite quilting tool?